This guide describes how to deploy the Tanium Client 6.0 and Tanium Client 7.2 to enterprise endpoints. What is the Tanium Client? These powerful features enable large, geographically distributed organizations to identify and respond to a zero-day exploit, security breach, or application outage in a matter of seconds or minutes rather than days and weeks. When the Tanium Client software is first deployed to an endpoint, it initiates a direct connection to the Tanium Server assigned to it in the initial configuration. During initial registration, the Tanium Client establishes a unique ID and receives from the Tanium Server the latest client settings, a list of nearby peers, and the latest sensor, question, and scheduled action definitions. By default, the initial registration status is configured to reset approximately every four hours, forcing the Tanium Client to re-initialize registration. This ensures the latest settings are applied and that optimal peers are selected. The Tanium Client also re-registers with the Tanium Server via a normal registration that happens at a defined registration interval. The default registration interval is a randomized time between 30 and 90 seconds. During a normal registration, the Tanium Client informs the Tanium Server of its current state of questions, actions, and settings; and, in response, the Tanium Server sends new questions, actions, or settings to apply. In large environments, normal registrations are the primary way that Tanium Clients receive new questions, actions, and settings. In an enterprise network, the Tanium Clients establish peer relationships. Peer connections are continual, long-lived connections used to exchange Tanium messages and files. The information is exchanged among peers in a linear chain. During registration, the Tanium Client receives a peer list of other Tanium Clients to which it can try to establish a peer connection. The Tanium Client uses the list to determine which neighbors are the most optimal network peers. By default, each linear chain has 100 Tanium Clients. These chains are known as neighborhoods. By design, each neighborhood has one forward leader and one backward leader at the ends of the chain. Other than at registration, only leaders establish direct connections with the Tanium Server. 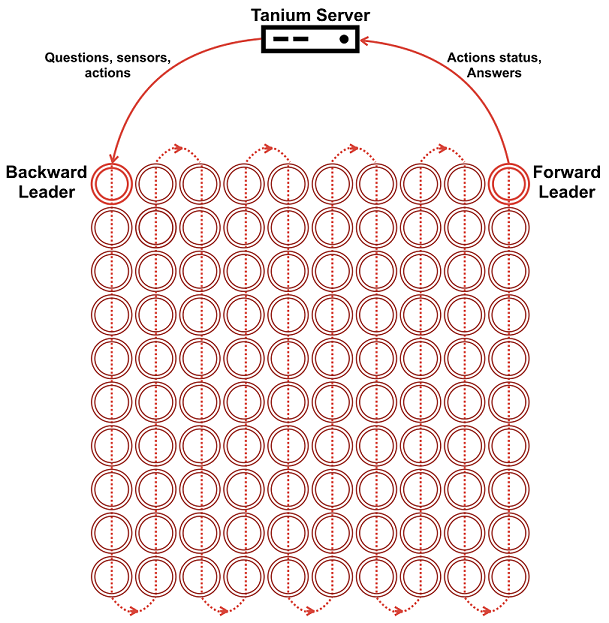 The Tanium Server passes sensors, questions, and scheduled actions to the backward leader, which passes them to its forward peer, which in turn passes them to its forward peer, and so on, until they reach the forward leader. The forward leader returns the question answers and the scheduled actions status to the Tanium Server. Tanium peer communication is designed to accommodate new clients that come online, to route around clients that are removed or stop communicating effectively, and to reflect around network-level blockages, such as firewall blocking. Forward reflection occurs if a Tanium Client cannot establish an outgoing connection to a forward peer in its peer list: the client establishes its forward connection to the Tanium Server instead and becomes a forward leader. Similarly, backward reflection occurs if a Tanium Client cannot establish an outgoing connection to a backward peer: the client establishes a backward connection to the Tanium Server and becomes a backward leader. Tanium Clients establish outgoing connections to backward peers for file distribution (see File distribution). Client peering results in a profound reduction in connections and bandwidth over WAN links. The following figure illustrates the proportions of the savings in a large enterprise network that includes subnets in data center, headquarters, and branch offices, as well as VPN connections from remote workers. Other than during registration, only the remote VPN clients and leaders, depicted in bright red, connect to the Tanium Server over the WAN (the Internet, in this example). The remaining clients, depicted in faded red, share data over peer connections on the LAN for each subnet. To customize client peering settings to suit your deployment, see Configuring Tanium Client peering. Reduces the number of files that the Tanium Server distributes over WAN links. Instead of sending files to all managed endpoints, the Tanium Server sends files only to the few that are designated as the backward leader of a client neighborhood. Each backward leader then relays the files over a high-speed LAN connection from one forward peer to another until they reach the forward leader. Enables clients to redistribute files in small chunks known as shards. Each client maintains an intelligent local cache of the shard files that the Tanium Server previously distributed to the client neighborhood. The result is that when the same files are requested later (for example, when an action runs again), clients can reassemble the files by collecting shards from their peers over the LAN, rather than requesting that the Tanium Server redistribute the files again. By default, each client maintains a shard cache of 100 MB. Each client keeps particular shards based on an algorithm to ensure an efficient distribution. These caches are also self-cleaning based on an algorithm that prioritizes recently used shards. To distribute a file, the Tanium Server first downloads it and divides it into multiple shard files. Each shard is associated with a hash value. The Tanium Server then creates a manifest that maps all the component shards to the entire file. When you use the Tanium Server to distribute a package that includes a file, the package includes the manifest for that file. The Tanium Server does not deliver shards through the registration process as it does for questions and actions. Instead, the Tanium Server delivers shards to each Tanium Client neighborhood through the backward leader. When a Tanium Client receives the package and associated manifest file, it first checks its own cache to see if it already has any of the shards listed in the manifest. The Tanium Client then generates a new request message for all the shards that it could not find locally. This request message first flows forward along the linear chain to the end of its local neighborhood. As the request message traverses the chain, each peer checks its local cache for the listed shards. If the peer has one of the requested shards, it sends that shard to the requesting peer. To avoid duplication, it also removes that particular entry from the request message before propagating the message to the next peer in the chain. If Tanium Clients do not find all the shards after the forward flow along the chain, the clients send a request for shards that traverses the chain in the reverse direction. If shards are still missing after each peer has investigated its cache, the first Tanium Client requests the missing shards directly from the Tanium Server and distributes them appropriately. The 7.2 core platform has native support to enable TLS for the Tanium Client 7.2 to Tanium Server 7.2 and Tanium Client 7.2 to Tanium Zone Server 7.2 connections. For details, see the Tanium Core Platform Deployment Reference Guide. For Tanium Client 6.0, or for earlier server versions, the TLS settings are ignored.